What Are 32-Bit and 64-Bit Apps, and Why Do They Matter? You may have heard recent news about Apple's warning to end users that the company intends to phase-out 32-bit apps running on macOS computers in 2019. And you may be wondering a few things, such as what are 32-bit and 64-bit apps, and why do they matter? We'll get to that below, but first, let's cover some things you may be encountering as part of this change. Apple has been gradually pushing developers to move their software to 64-bit since mid-2017, and as part of its agenda, in recent month, you may have seen a popup message like the one below when launching apps on your Mac. The somewhat vague dialog that says that the app is "not optimized for your Mac" and "needs to be updated by its developer" offers little help as to why that is the case. This alert first appeared when macOS 10.13.4 was released, back in April, and depending on how many old apps you have, and use, you may have seen it often. Below we'll explain what the "WhatSize" is not optimized for your Mac alert means, and how to find apps that will need updating. What's the difference between 32-bit and 64-bit apps? Understanding the difference between 32-bit apps and 64-bit apps can be confusing as such terminology is often obscure, and sometimes is understood only by initiates. In the example alert shown above, this is a good example; Apple doesn't explain much, but this dialog suggests that something is awry. macOS is going to require that all apps be 64-bit in the future, and most average users have no idea what that means. Is it about bandwidth, how fast they can download files from the internet? Something about the quality of audio files or photos? Or does it have something to do with file size, which is measured in bits and bytes (and mega-, giga-, and tera-)? Without going into too much detail—if you want the nitty gritty, you can read this webopedia article that explains what is 64-bit computing—64-bit apps allow your Mac to do more, and do so more quickly. Bits are calculated as powers: one bit is 1, two bits is 2, four bits is 8, and so on. 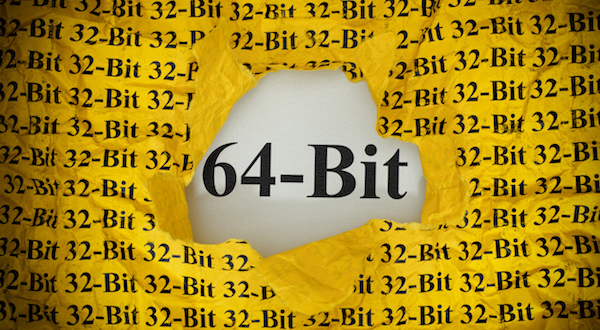 Essentially, 64 bits allows for numbers as high as 18 quintillion, meaning that a computer can calculate more, faster. That's a simplistic way of explaining this, but another way of looking at this is that with 64-bit computer, a processor can use—hold on to your hats—16 exabytes of memory. (An exabyte is 1,000 petabytes, a petabyte is 1,000 terabytes, and a terabyte is 1,000 gigabytes.) When we get down to that scale, most people understand the numbers; in fact, your Mac probably has at least 8 gigabytes of RAM, perhaps more, but nowhere near those numbers. This doesn't mean you need to go out and buy a truckload of RAM for your iMac, but that its processor can pretend to be able to access huge amounts of virtual memory. Bits matter because processors used on today's Macs are 64-bit, and running 32-bit apps will be inefficient. Apple isn't shutting the door right away; instead, they're giving app developers plenty of time to update their apps. The cutoff won't be with macOS Mojave, due out this fall, but with next year's operating system. "At our Worldwide Developers Conference in 2017, Apple informed developers that macOS High Sierra would be the last version of macOS to run 32-bit apps without compromise." It's not clear what Apple's "compromise" is, but it's possible that 32-bit apps will run in Mojave with some sort of emulation. This means that they may run more slowly, or manage memory less efficiently. It's likely that you won't notice this when using older apps, but for apps that depend heavily on graphics, there may be some limitations. You could launch every app on your Mac; in doing so, High Sierra will display the dialog referenced above the first time you launch each app, but not later. So launching all your apps now won't help much, unless you plan to chase down their developers right away and query whether their apps will be updated. Some apps will not be able to be updated, others have already been updated. You probably won't notice when your favorite apps are updated to 64-bit, unless you read the release notes for update. You can search your Mac to find which apps are 32-bit. To do this, choose the Apple menu, then About this Mac. Click System Report, then scroll down and select Applications. The rightmost column header is 64-bit (Intel). Click this header to sort applications. Those applications where No appears in this column are 32-bit. One thing you'll notice is that big-ticket apps—Microsoft Office, Adobe Creative Cloud, and Apple's iWork apps—are already compatible. But you'll see a lot of applications that you probably don't know about. For example, the driver for one of my scanners shows as not being 64-bit, as you can see above, yet I don't think of it as an "application," since I never launch it as such. Many 32-bit applications are drivers for hardware devices. 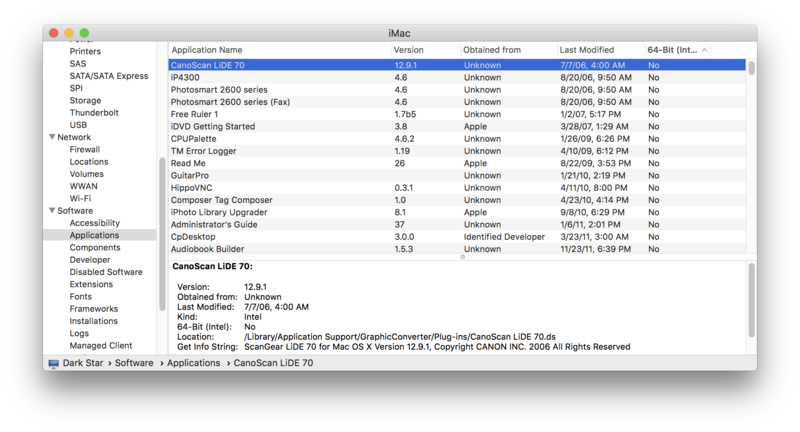 Likewise, some are from Apple, such as the DVD Player app, QuickTime Player 7, printer drivers supplied by Apple, and a number of extensions that are part of macOS. Apple will most likely update the system elements, but will they update QuickTime Player 7, which is "deprecated," or DVD Player? What will happen if I run 32-bit apps? For now, nothing. But check to see if there are updates for the apps you use, especially if they are required for hardware devices, such as scanners, printers, keyboards, and other tools. You still have more than a year, so if there are apps that show up as not being 64-bit, and you don't use them often, but may still need them, launch them and check for updates. If you depend on them, contact their developers to ask if and when they're planning to update the apps. You may find that some will become obsolete, so you'll have plenty of time to search for replacements. It's worth noting that those hardware drivers don't usually display auto-update dialogs, so you'll need to check the websites of the manufacturers and grab the latest versions of their software. This change is necessary to ensure that hardware and software work as efficiently as possible. Understanding the vague dialog that displays when you launch a 32-bit app will help you plan ahead. There's no need to worry too much now, but when macOS Mojave launches, you may find that some apps are not as fast or as efficient as you're used to. So start checking to see if there are newer versions now, or find other apps to accomplish the same tasks. This entry was posted in Software & Apps and tagged 32-bit, 64-bit, Mac Apps, macOS Mojave. Bookmark the permalink.